Classic Italian cheesy chicken dish that’s one of the most favored chicken dishes of Italy. 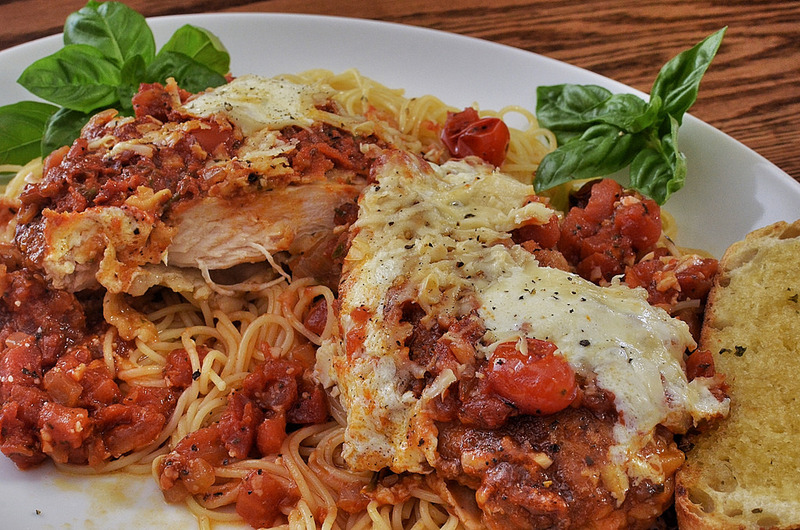 Chicken parmesan is prepared with tomato sauce and a mix of various cheeses. It is a cuisine which is sure to be liked by your family and friends when you serve it at main course meal table. Put chicken breast halves in re-sealable freezer bags or between heavy plastic sheets and place on a solid and leveled surface. Pound chicken with the smooth side of meat mallet to a thickness of ½ to ¾ inch. Season chicken with salt and freshly gr1ound black pepper. Lightly beat eggs in a wide shallow bowl and keep aside for a while. Combine breadcrumbs with ½ cup of shredded parmesan cheese in another wide shallow bowl, mix well and keep aside. Place flour in a strainer or sifter and sprinkle evenly over pounded and seasoned chicken on both sides. Dip flour coated chicken pieces, one at a time in beaten eggs and transfer to breadcrumbs mixture, pressing the crumbs on to both sides of chicken pieces; keep aside on a tray. Repeat the process with rest of chicken and let them rest for 15 minutes. Meanwhile, preheat your oven at 230 degrees Celsius and put a large skillet over medium high heat with enough oil in it to heat. Fry crumb coated chicken in hot oil from both sides for 2 minutes each side or until golden brown on both sides. Transfer fried chicken pieces into a baking dish. Top each piece with equal amount of chunky tomato sauce; layer each pieces evenly with chopped pieces of mozzarella chopped basil and provolone cheese. Sprinkle with remaining ½ cup of parmesan and drizzle with 1 tbsp of olive oil all over the top surface. Bake in preheated oven at 230 degrees Celsius for 20 to 25 minutes or until cheeses are browned and bubbly, and chicken breasts are no longer pink in the center. An instant read thermometer should read 75 degrees Celsius when inserted at the center of chicken breast. Bring out of the oven and serve over cooked spaghetti and/or toasted bread slices, garnished with whole basil leaves, enjoy.